This is an image of one of John Buldyke's delivery trucks. 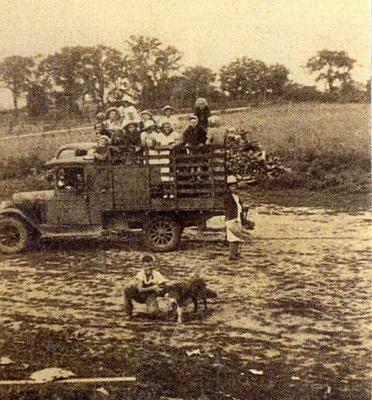 The trucks were used to pick up berry pickers and also to transport raspberries to the wholesale markets in Toronto. John Buldyke's farm was located in the north half of lot 31 on concession 5, just west of Brooklin. The 50 acre parcel of land was purchased by my grandfather, John Buldyke, in 1925. Then in 1954 it was purchased from my grandmother by my father. The farm was kept in our family until it was sold by my mother after my father died in 2000. The farm is now Devil's Den Golf Centre. My grandparents (and later my father) had a raspberry farm.